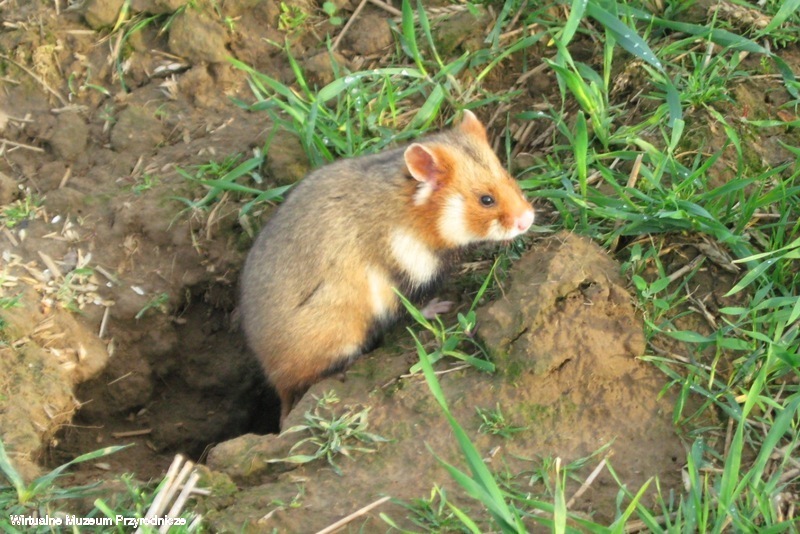 A small yellow-brown rodent with a short tail and round upright ears. The belly is black and yellow-white markings on its nose, shoulders and cheeks. There are many dark variations sometimes completely black (melanism). Originally from prairies, since they need to dig, nowadays found in grain fields. Mostly feeding on seeds and fruit but can take small bugs or even frogs as well. Lives alone and digs tunnels for protection and storage chambers in which it hibernates. ⇔ hbl. 20-34 cm, tl. 3-5 cm syn. Eurasian hamster, Black-bellied hamster, European hamster The wild animals can be much larger than the pets we know.